Cheap Log Cabins - Who Has The Best ? Cheap log cabins can still bring the benefits of their more expensive cousins, and that makes them one of the most versatile garden buildings available today. 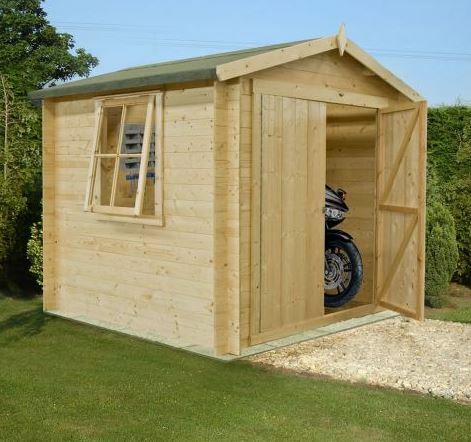 The use of planed logs for the cladding makes them very tough, durable, and reliable, which in turn makes them ideal for use either as a garden storage facility or a building that you can relax in or even use as an extension of your home, although of course planning permission may be needed depending upon their size. As a cheap log cabin is typically smaller than more expensive versions, however, that is less likely to be a problem. With so many log cabins to choose from, WhatShed have created this handy guide to the 20 best log cabins available to buy online in the UK today. When selecting our list of the very best cheap log cabins, we first had to define exactly what ‘cheap’ was. Log cabins can come with a significant price tag attached, but for the purposes of this league table we’ve defined a cheap log cabin as any that costs less than £1100. Within this list you’ll find log cabins that are just below this price as well as some that are hundreds of pounds below it. When determining the final order we’ve considered the value for money that each log cabin offers, as well as their aesthetic appeal and any additional features and warranties that they have. 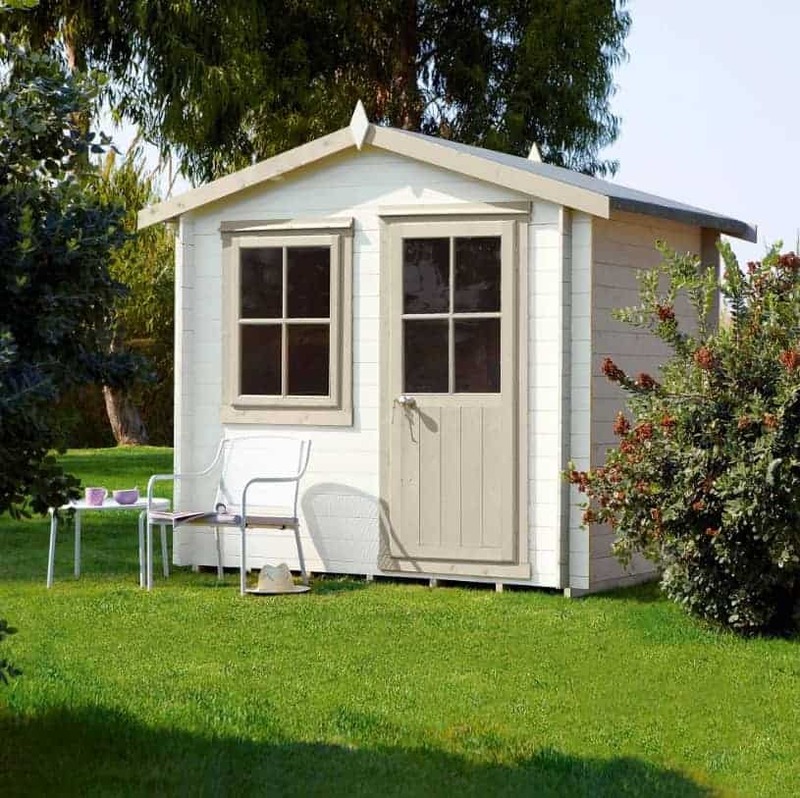 As we’ve seen, cheap log cabins come in lots of different shapes, styles and sizes, so in this highly competitive category it’s well done to the mini studio with veranda available from Waltons. It’s combination of an attractive design, additional features, and a long extended warranty helped it claim the top spot in our list of the best cheap log cabins that can be bought online in the UK today. Whether you’re looking for log cabins, metal workshops, or anything in between WhatShed will continue to bring you the independent reviews that can help you make an excellent buying decision. It’s fair to say that log cabins that cost less than eleven hundred pounds, which is our cut off point for this cheap log cabins category, often lack the additional features and stylistic elegance of larger and more expensive log cabins, but not in the case of this 8 x 9 model. 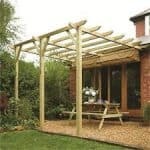 The addition of a wooden canopy and veranda creates a very attractive garden building, as well as providing a veranda space with balconies at either side of it that make an ideal place to hold a barbecue or simply to use as an outdoor space to sit down and look out at the garden. 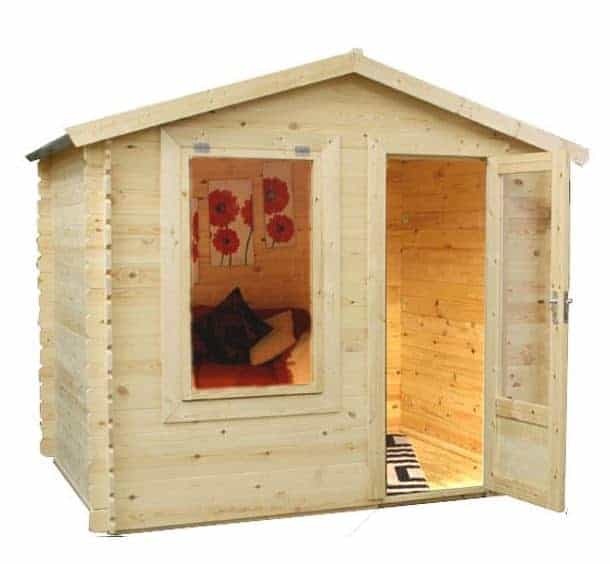 It’s this value adding feature for what is already one of the less expensive cabins on our list that takes this to the very top of our league table of the very best cheap log cabins that can be bought online in the UK today. 19mm interlocking logs have been used throughout, as we often find with the cheap log cabins we review, but we were pleased to see that on this occasion they come with a 10 year warranty against rot, a welcome feature that isn’t always provided. Light is supplied to the interior by way of one large opening window and a fully glazed single door, and as the door also comes with a key operated lock you can be sure that whatever is stored inside is safe and secure. 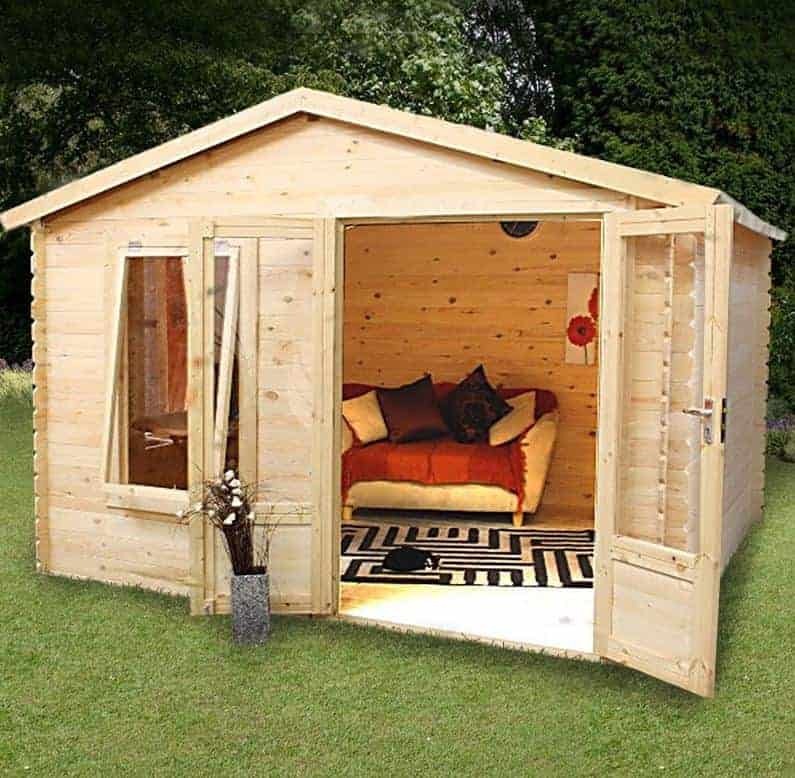 Offering over a hundred square feet of floor space for a price of under eight hundred pounds, this is one of the best value cheap log cabins that we’ve reviewed, and it’s this that has helped it gain the runner up spot in our top 20 list, as well as its traditional good looks. Made with 19mm tongue and groove log cladding, it features a classic rectangular design with an apex roof at the summit that quickly carries rain away. This process is also helped by the interlocking cladding itself, which is one of the reasons that the building has a 10 year warranty against wet rot as long as the treatment schedule is adhered to. There is a single door that contains four glazed panels, and we were pleased to find a key operated lock included as standard which isn’t always something that we see in the other cheap log cabins we review. Adjacent to the door is a square window and between this and the door we found the interior of the log cabin to be more than adequately illuminated on a sunny day. One other feature we appreciated was the inclusion of pressure treated joists which by raising the floor gives it long lasting protection against the threat of ground moisture. Log cabins can be a prime target for opportune thieves, thanks to them frequently containing valuable items of furniture and electrical equipment, and having a profusion of glass that lets potential thieves see just what’s inside. That’s why this scores very highly, as it has a completely window free design. This means that there is no way that an opportune thief can see if there is anything valuable kept inside or not, and that makes it less likely that it will be targeted or broken into. For that reason, this is one of the most secure cheap log cabins we’ve seen, especially if a padlock is also added, and this helps it climb into the top three of our league table. Other than the lack of windows this follows the standard compact log cabin design that we so often see. One exception is the wide opening double doors that dominate the front of the building. Fully braced to give them extra strength, they open to a very accommodating width of 1.49m and so make it easy to move wide or bulky items inside. What also made this stand out against other log cabins is its generous size, having a base width of 2.56m and a base depth of 3.85m, and the fact that the log cladding used is extra thick at 28mm. For those looking for a tough, secure, and yet inexpensive log cabin this is hard to beat. 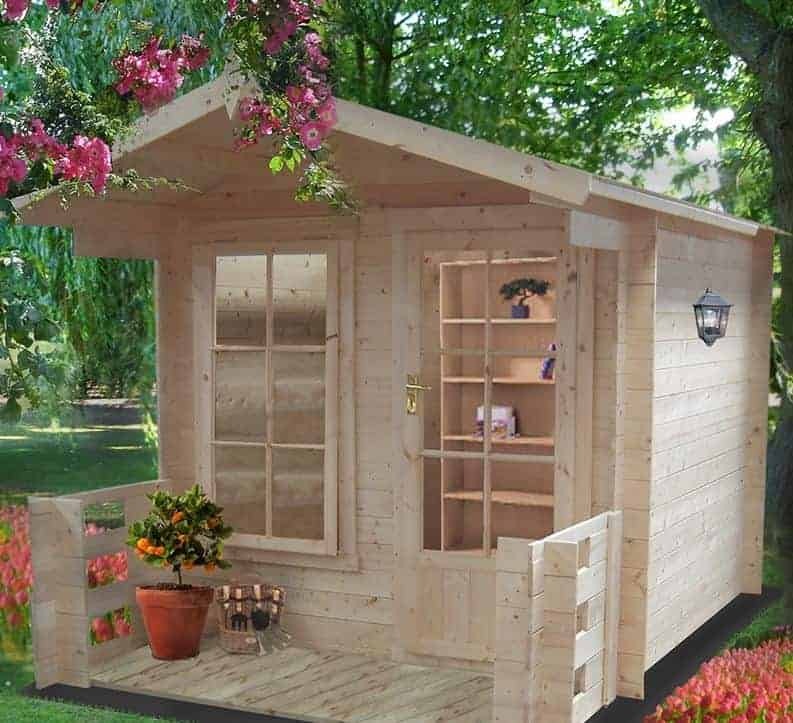 This tough garden building costs just a little over a thousand pounds, but it’s also the largest in our list of the 20 best cheap log cabins, so we still feel that it represents good value when compared to others we’ve reviewed of a similar size. 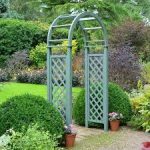 It’s also very attractive, and can become a decorative feature in the garden as well as a practical place to store items, or to use as a workshop or home office. With a width of 3.51m and a depth of 4.09m there’s lots of room to move around in, and thanks to an apex roof that gives a peak height of 2.47m there’s lots of head room as well even for the tallest person. The first thing that caught our eye was the fully glazed double doors, and with the inclusion of three long windows as well there is lots of natural light available. It was good to see as well that the windows can all be opened which means that the interior is very airy as well as bright, making it a pleasant environment to spend time in. With the 19mm log cladding being covered by a 10 year guarantee against rot, and chalet connections providing extra strength as well, this deserves to be considered by all who are looking for cheap log cabins that still offer a large interior. 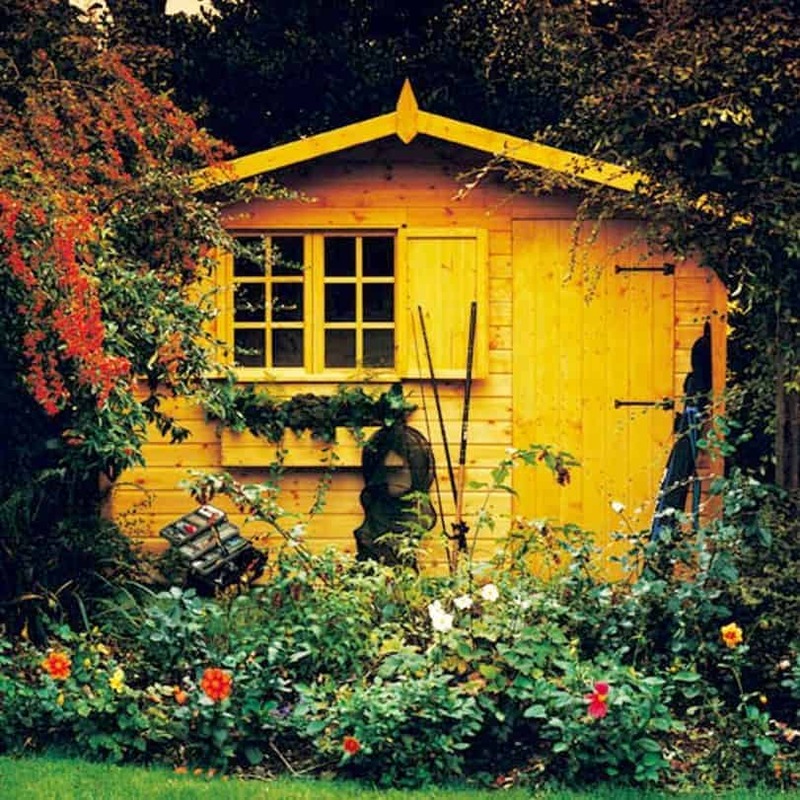 Cheap log cabins bring advantages over standard garden sheds in that they typically feature thicker cladding, making them stronger, more stable and more reliable. They may often be slightly larger as well, but as this cabin shows that doesn’t have to be the case. It has a base width of 2.99m and a base depth of 1.79m which equates to a little over 60 square feet. 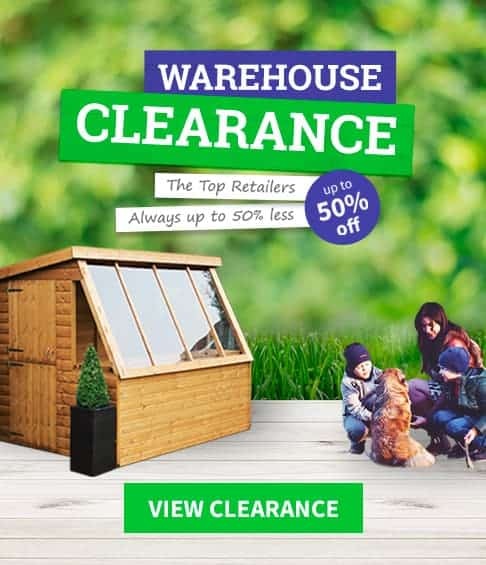 This in itself can be an advantage to some customers, as it means that whilst there is still enough room to relax in comfort or to store a good selection of tools and equipment it won’t take up too much room in the garden. Another reason that we rate this as one of our favourite cheap log cabins, as well as its compact footprint and affordable price tag for a garden building that comes with a 10 year guarantee, is that it can be transformed into a secure windowless building. One window is included, but it comes complete with shutters. That means that the window can be used to let natural light in whilst the log cabin is being used, and yet closed up entirely at other times to prevent anyone seeing inside. It’s a neat touch, and the shutters themselves are attractive, and yet it’s one that we rarely see on the log cabins and sheds we review. This log cabin may be at the smaller end of the scale, with a base width of 2.50m and a base depth of 2.00m, but it still brings the advantages of its larger cousins. 19mm logs are used for the walls, roof and floor which makes them very durable and weather resistant, and so even though the substrate has only been given an initial dip treatment, rather than a long lasting pressure treatment, the manufacturer has still been able to supply a 10 year warranty against rot. 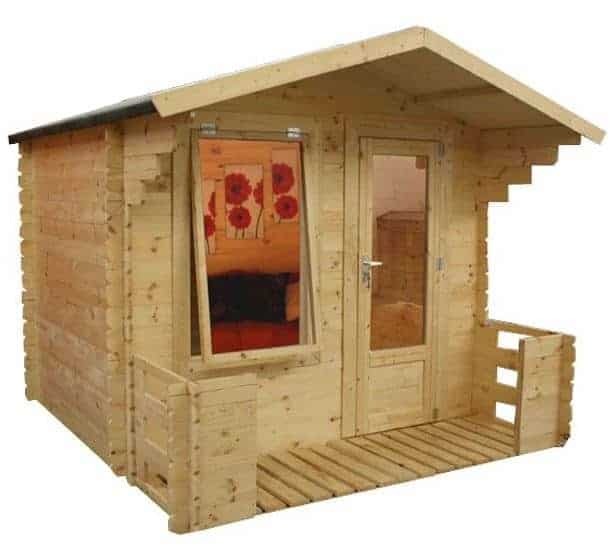 This provides both peace of mind and added value for money, and with a price of less than eight hundred pounds already representing good value this is more than enough to earn it a place in the top half of our league table for the best cheap log cabins. 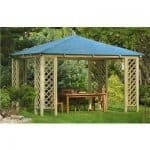 Style wise it adheres to a simple and yet classic design, and we feel it will add a touch of class to any garden. The single door is fully glazed, and next to the door is a single window which can be opened upwards to let in fresh air. There’s a key operated lock included as standard as well, which we always welcome especially as they aren’t always found on the cheap log cabins we review. If you need a reliable and long lasting log cabin for a very reasonable price, this is a good place to start. Cheap log cabins can take many shapes and forms, and this is a log cabin that has a design of its very own. 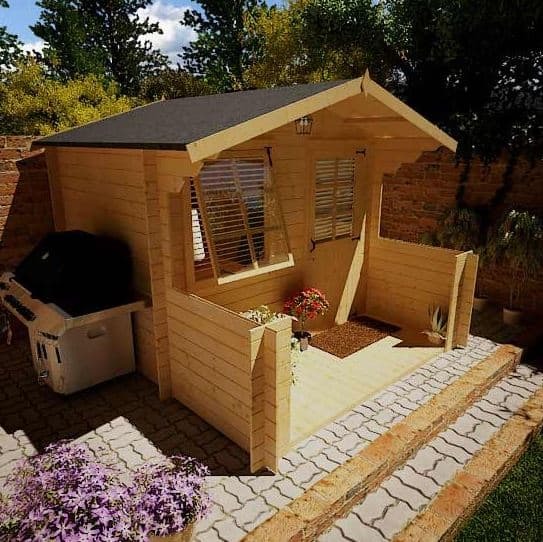 It’s a striking garden building, and whilst some may feel that it lacks practicality the originality and attractiveness of this building, not to mention the value for money it represents, is enough to give it a lofty position in our league table of the very best budget log cabins that can be bought online in the UK today. Its base dimensions of 3.25m x 3.25m with an apex roof that reaches up to 2.5m makes it one of the largest cheap log cabins in our league table, and the cladding itself is made up of 19mm logs. Where it differs so radically, however, is that instead of glazing it has intricately cut out sections for the front entrance and two side windows. This gives it a stylish look unlike any other log cabin we’ve reviewed, although it also means that it doesn’t offer the security or weather protection that most other log cabins do. It will certainly be an airy and welcoming place to relax on a warm day, however, and we feel it could be a perfect place to site a hot tub. This is the most expensive of the cheap log cabins on our list, coming in at a penny under our defined limit. This has been taken into account, and is why it has a lower position than it could otherwise have achieved, so if you have a budget that won’t be stretched by this asking price then we feel it’s definitely worthy of consideration. 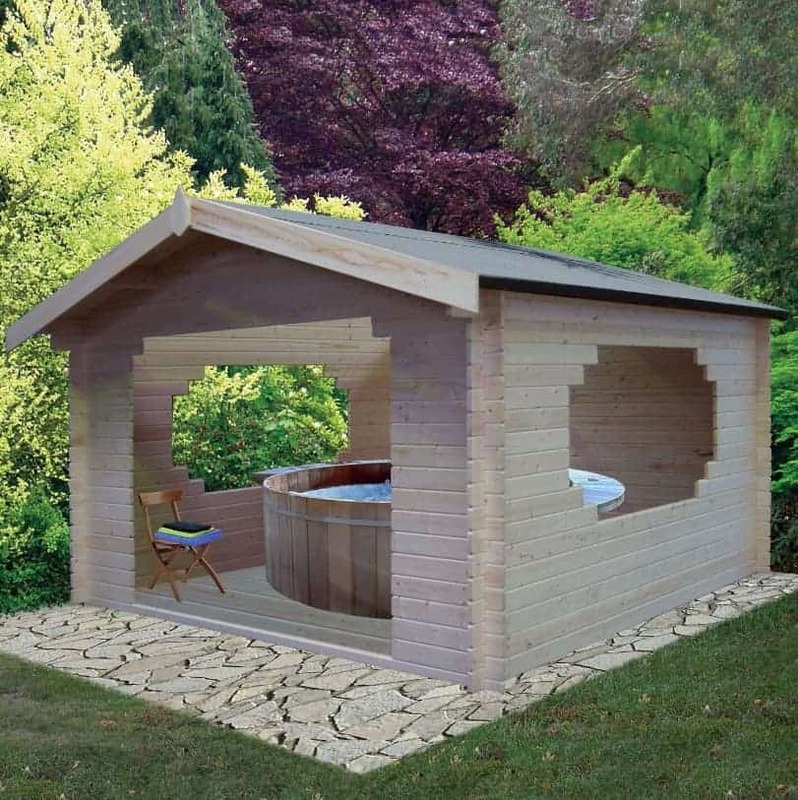 With a width of 3.00m and a depth of 2.50m, there’s not only enough room to use this as a base to enjoy your garden from, it could also be used to entertain guests in, and they’re sure to be impressed by the appearance of your log cabin. In our opinion, this is one of the most attractive traditionally styled log cabins that we’ve reviewed, chiefly because of the profusion of glazing that stretches across the whole of the front of the building. The single hinged door, which features a secure key operated lock, is fully glazed, and it has two long windows alongside it that run from the tall eaves to the floor. We liked the Georgian style that had been applied to the glazing as well, and this is one of the cheap log cabins that looks much more expensive than it actually is, and that will add a touch of class to any landscape. This shares traits with the two buildings directly above it in our list of the top 20 cheap log cabins, in that it shares a price tag of just one pence less than eleven hundred pounds and it has a unique look all of its very own. The base dimensions, however, at 2.99 x 1.79m are significantly smaller which is why it features in a lower position. Nevertheless, it does come with a 10 year warranty which is more than the majority of the log cabins on this list do, and even though it’s dependent upon the customer carrying out yearly retreatments we appreciate that many customers find such warranties very reassuring. The thing that separates this, appearance wise, from all the other cheap log cabins we’ve reviewed is that it has a large overhanging apex roof that forms a canopy. We’re used to seeing small overhanging sections of roofing, but this extension is almost as deep as the main body of the log cabin itself. 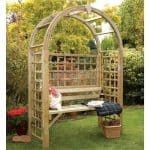 It’s visually striking, and yet very practical too as it provides an ideal shaded or rain protected area in which to sit on a patio chair or hold a barbecue. With 28mm logs used for the wall cladding as well, it is only the smaller interior that stopped us placing this much higher up our list. This is the second cheapest of the cheap log cabins on our list, and it is the exceptional value for money that carries it into the top half of our top 20 league table. It looks like a log cabin that would cost much more, especially as it also comes with a classically styled veranda with 19mm log walls on either side of it. 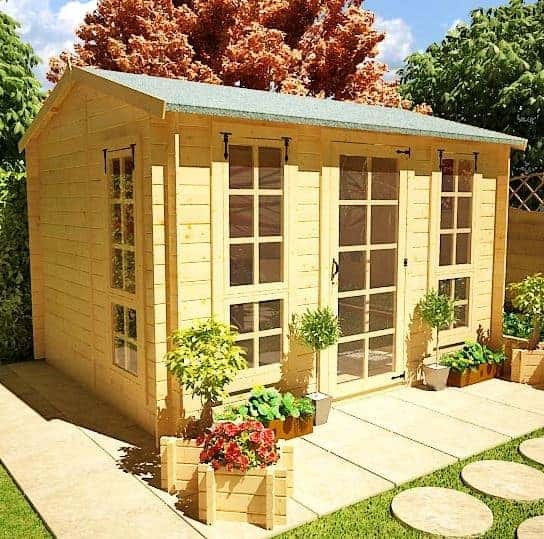 This is a cabin that you’ll be proud to have in your garden, and no-one will suspect that it cost less than six hundred pounds. The veranda and the decorative struts that hold up the slight overhang of the apex roof create an Alpine appearance that we found very pleasing on the eye, and of course this can be enhanced further when the cladding is painted or stained. There’s also a half glazed door and a large opening window, so the interior is very airy and very light at the same time. 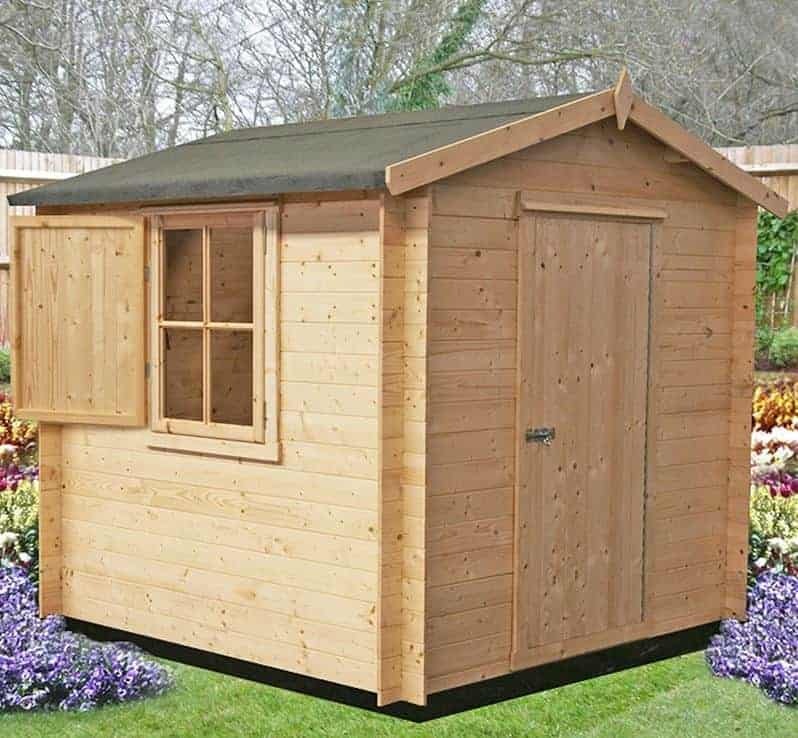 With so much to recommend this building, especially as it’s also quite spacious thanks to a base width of 2.87m and a base depth of 2.90m, it’s only the lack of an extended warranty that prevents it being ranked among the very top cheap log cabins that we’ve reviewed. 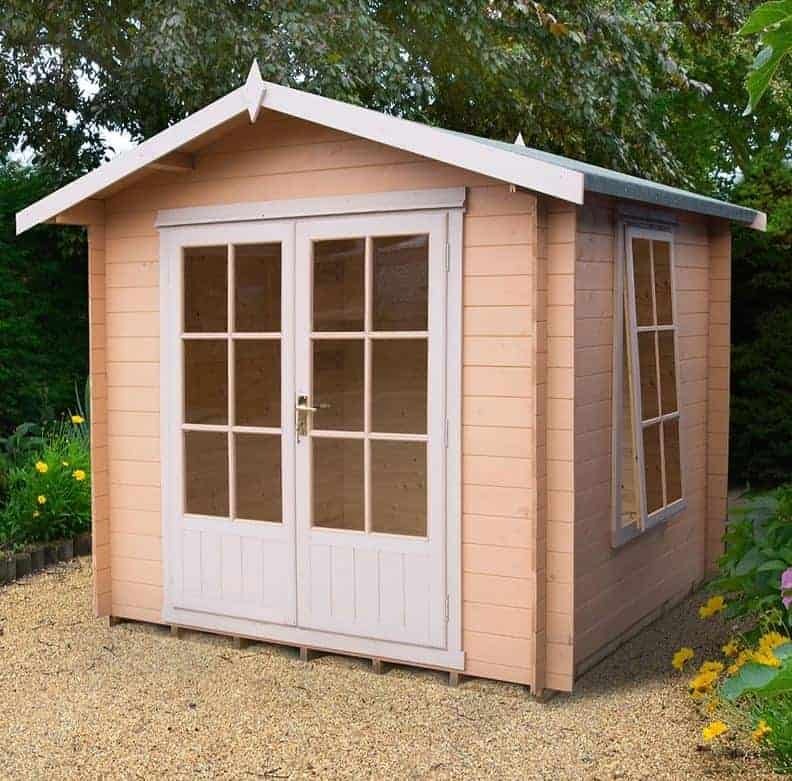 At a price of not much more than eight hundred pounds, this is mid priced compared to the other cheap log cabins that make up our top 20 league table, and yet it has a relatively small footprint with base dimensions of 2.09 x 2.09m. What helped this particular log cabin earn its place in our list however was the wide opening double doors that take up nearly the whole of the front face. They’re not elegant and don’t have the glazing that we’re used to seeing on the doors of the log cabins we review, and yet they’re braced, strong and very generously proportioned. With such a wide opening it’s very easy to move furniture inside, and we can also picture it being used to store items such as motorcycles or ride on lawnmowers. There’s one other feature that we really welcomed, and that is that the logs and the integrated floor joists have been pressure treated. This gives them very long lasting protection against the threat of rot, but it’s a pity that in this case it doesn’t mean that the cabin comes with a long lasting warranty as well as we would normally have expected in such a case. If this had been supplied, then we would have rated this among the very best cheap log cabins available today. 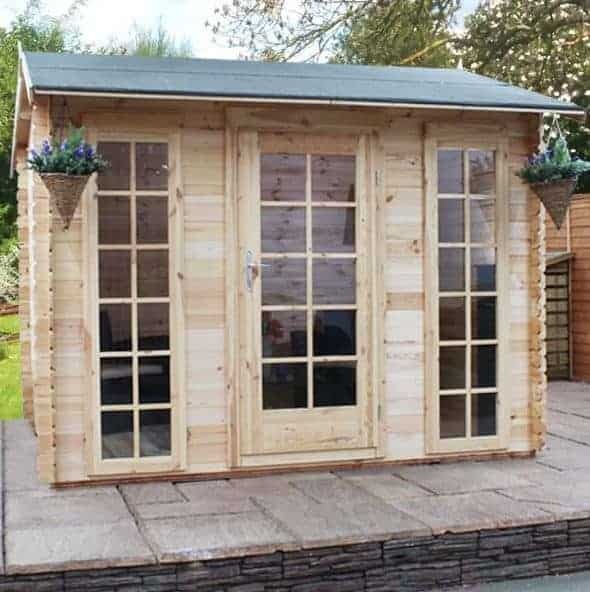 We’ve reviewed lots of BillyOh log cabins and whilst they come in lots of styles and lots of different sizes we always find that they represent very good value for money. That’s certainly the case here, as the cabin has a base width of 3.25m and a base depth of 2.79m and yet it’s available for just under eight hundred and fifty pounds. This makes it one of the best cheap log cabins we’ve seen, especially as it features an integrated floor as standard which is a feature that we don’t always find from this particular manufacturer. What adds even further to the value is that this is a very stylish and good looking log cabin. It has a wide single door that is centrally positioned and that is fully glazed, with two wide windows adjacent to it. There are two further windows on the side walls as well, making this a very well illuminated log cabin, almost reminiscent of a summer house. We were pleased to see that the windows contained tough shatter resistant styrene as well, meaning that with the addition of a padlock this can be very secure. With so much to recommend it, only the lack of a long warranty stops it being placed in the top half of our guide to the 20 best cheap log cabins. When many people think of log cabins they think of beautiful buildings nestling in an Alpine landscape, but you don’t have to spend a lot of money to have a similar effect in your garden as this Banf cabin shows. The chalet connections at the corners provide extra strength and stability where it’s needed most, and yet they are also highly decorative and in conjunction with the log and glass mixture of the frontage under a tall apex roof create the Alpine look that so many love. It’s this combination of practicality and aesthetic appeal that take this building into our league table of the very best cheap log cabins, even though it’s one of the more expensive entrants. There are double doors that open out to a width of 1.23m and the width of the cabin as a whole is 3.30m to go with a depth of 2.68m. This means that you can fit a lot inside, and with such wide opening doors storing and removing items is simplicity itself. Once inside they can be kept secure by a key operated lock, always a feature that we welcome. We also liked the two opening windows, and the 4mm glass we found is thicker than that which is often used on cheap log cabins. The thing we liked most about this log cabin is that it has a simplicity about it that can also be striking. It has a width of 2.09m and a depth of 2.39m, but because of the wide opening double doors that dominate the front face it’s easy to move items in and out, and in effect this means that you can really make the most of all the space that’s available. The doors themselves are 1.42m wide, making them amongst the widest that we see on cheap log cabins as compact as this one, and they have a height of 1.81m or nearly six feet. It’s this measurement that’s especially important, as it means that we could walk in and out without having to stoop too much. The doors then help to make this one of the more comfortable cheap log cabins we’ve reviewed, especially as they’re also fully glazed and therefore ensure that there’s a good supply of natural light for the interior. This is further helped by one large window on the side panel, and we were pleased to see that it could be opened upwards and then secured in place to provide ventilation. With integrated floor joists to protect the floor as well, we feel this represents good value for money even though we would have liked to see a longer warranty period. 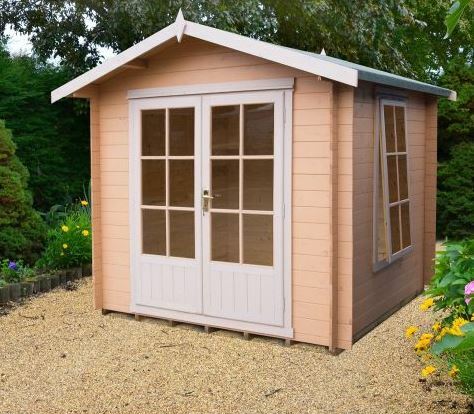 Most of the cheap log cabins we’ve reviewed feature 19mm log cladding, and this in itself gives them a big advantage over the majority of tongue and groove garden sheds when it comes to strength and stability. This alpine style log cabin, however, features logs that are 28mm thick. This is very noticeable once the building is installed, as it feels reassuringly solid and thus would be ideal for people who have gardens that are situated in areas that are often exposed to high winds. For such a strong and thickly clad log cabin to be available for less than eleven hundred pounds represents excellent value, which is why it has earned a place in our list of the 20 best cheap log cabins, but it also has a base area smaller than most others in the list, at 2.20 x 2.20m, and this too has been taken into consideration when determining its final position. 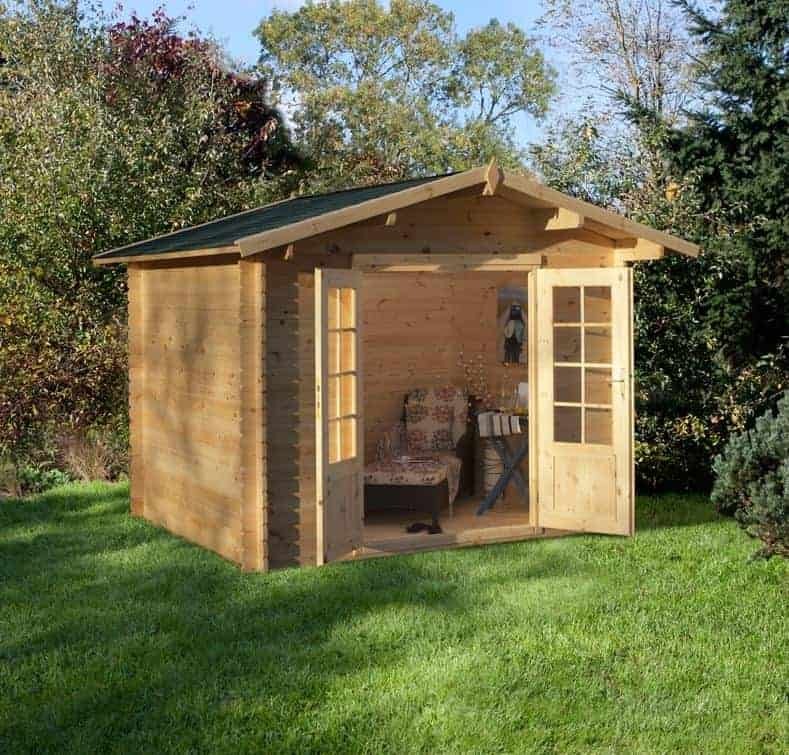 With glazed double doors allowing light in as well as adding to its traditional good looks, and a 0.30m roof overhang that provides shade on sunny days as well as giving added protection from the rain, this is a log cabin that we highly recommend to those whose budget it falls within. This log cabin combines the alpine style that’s become a garden building classic, and yet uses modern materials to ensure that it’s both tough and solid and yet very affordable at the same time. An example of this is that while 19mm log cladding has been used for the walls, as we see on the majority of the cheap log cabins that we review, more cost effective tongue and groove cladding has been used for the floor and the roof, where it’s then covered in a strong mineral felt. In these areas it’s 11mm thick, but we still feel that this is more than adequate for everyday use, although you may want to reinforce the floor if you plan on having anything particularly heavy inside. 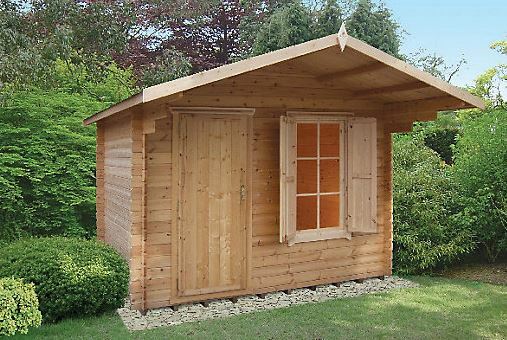 With a width of 3.25m and a depth of 2.66m, this is one of the largest cheap log cabins that we’ve seen available at this price, and this of course makes it a much more flexible building. 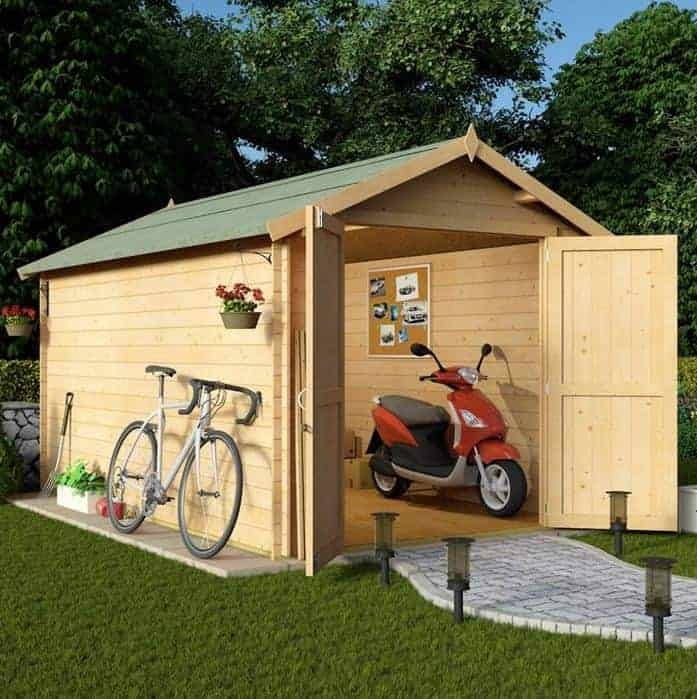 It can be used as a large and strong garden shed, or even as an extension to the house and an extra room to entertain guests in. As well as the half glazed double doors there are two separate opening windows, so whatever you use this great value garden building for there’ll be lots of light inside. When we first saw this 7’10 x 10’8 log cabin we were struck by its attractive design, and it should look even better when it’s been painted to prevent it fading over time. Both the single hinged door and the window alongside it feature Georgian style glazing, and this is something that we always welcome in the traditionally styled cheap log cabins we review. The glazing itself, however, is horticultural glass and so not as resilient as the styrene or safety glass that we often see, so the owner will have to be careful, especially if they have children playing around their log cabin. If the glazing, undoubtedly attractive though it is, could be a little tougher it was good to see that a lock and key system was provided as standard on the door. 12mm tongue and groove used for the roof and floor should be more than adequate, and of course the walls are made up of 19mm planed log cladding. The feature that we liked most was the overhanging roof and veranda below it, as it provides an extension to the log cabin that can be used to entertain visitors and much more. 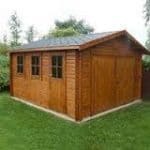 Once more it’s only the lack of any warranty over and above the statutory one year cover that prevents this being placed much higher up our list of the very best cheap log cabins available to buy online. When people think of Camelot they imagine somewhere that’s beautiful and magical, and whilst those terms don’t particularly fit this budget priced garden building it did enchant us enough to break into our list of the 20 best cheap log cabins in the UK. It has a plain design, and lacks the elegance and finesse that some of the other log cabins in this league table have, and yet it also represents fantastic value, and is in fact the cheapest log cabin in our list. 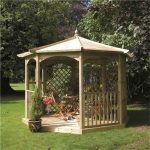 Thanks to GardenStyle consumers can now have the benefits of a strong and sturdy log cabin on their property for a price of less than five hundred and fifty pounds. For that outlay they’ll get a solid and well built building with a base depth and width of 2.09m. The felt covered apex roof reaches up to 2.25m and does a good job of sliding rainwater away, as does the 19mm log cladding. It only comes with a one year warranty and so the customer themselves will have to treat it annually with wood preserver, but this is such a regularly shaped and compact cabin that this shouldn’t be a long or costly process. We were pleased to see, however, that the integrated floor joists had been pressure treated, which we wouldn’t always expect in cheap log cabins that are as affordable as this. 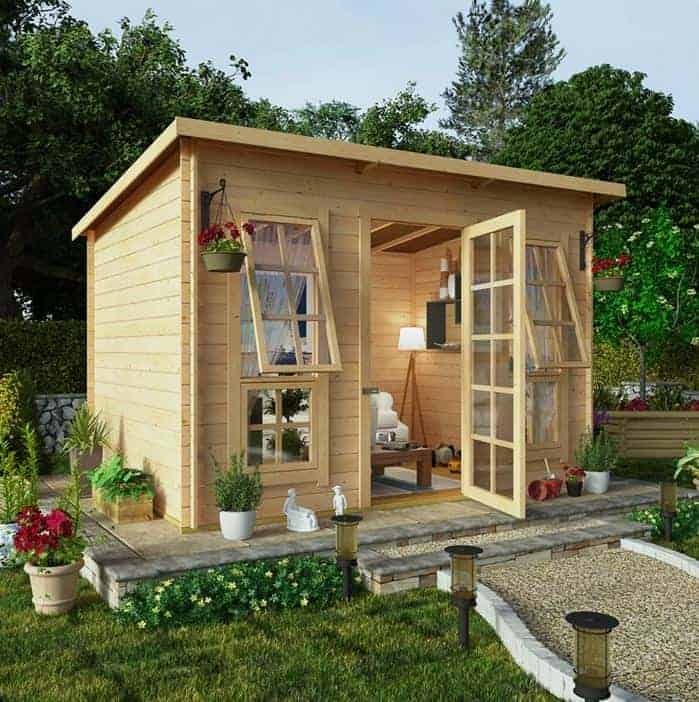 This cube shaped log cabin is ideal for those who want a strong and stable garden building, but don’t want to give up too much of their precious lawn space in the process. It’s the second Barnsdale cabin in our list, but its lower position is due to its more compact size and its relatively lower value for money. The width and depth are both 2.13m and it has a peak height at the summit of its apex roof of 2.10m. 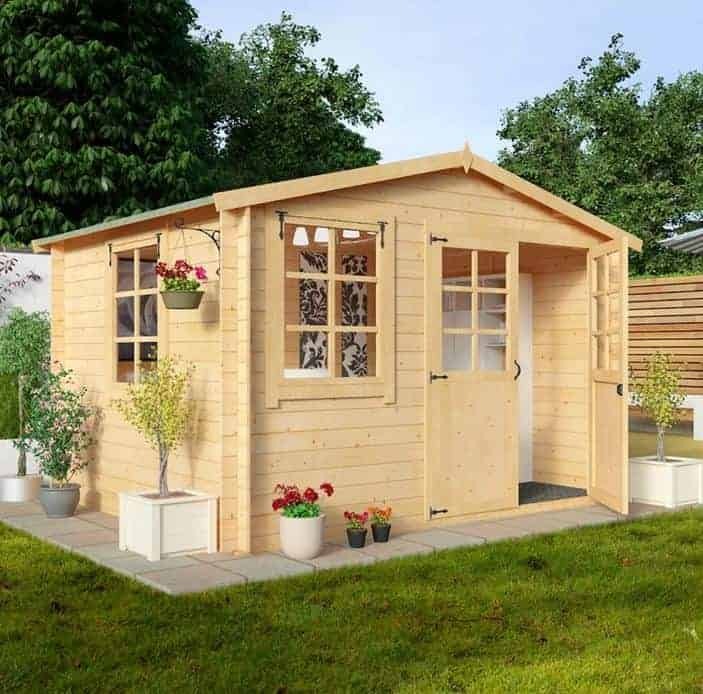 This makes it one of the most compact cheap log cabins to make it into our top 20 league table, and yet there’s still enough room for it to be a very handy garden storage space or even for it to be converted into a small home office during the summer months. One reason that we feel this would make a very comfortable location to work from is that the key lockable double doors are fully glazed in a Georgian style that we found very appealing. There’s another Georgian effect window on the side as well, and as this can be opened outwards, there’s a plentiful supply of light and ventilation for the interior. There was one further feature that we really liked, and which we don’t see enough of on the cheap log cabins we review, and that is a set of pressure treated floor bearers. It means that the floor is elevated above the threat posed by ground moisture, and this should help the log cabin to be very durable and rot resistant, as long as annual preservative treatments are applied to the log cladding. So far all of the cheap log cabins that make up our top 20 league table have shared one common feature: an apex roof. We complete the top 20, however, with a log cabin that looks completely different, and that’s because it has a pent roof. Although the pitch of a pent roof is obviously much shallower than that found on a typical apex roof, this one still does a very good job of carrying rainwater away rather than allowing it to settle, and as it has a peak height of 2.14m, to go along with a width of 3.26m and a depth of 2.46m, the headroom doesn’t feel too restrictive either. We really liked the look of this pent log cabin as it has a very classic look without being too ostentatious, and this, along with the great value for money that it represents has helped it climb into our WhatShed guide to the best cheap log cabins. There are two opening windows, and the single door is fully and attractively glazed, so there’s no shortage of light to read or work by once you’re inside. 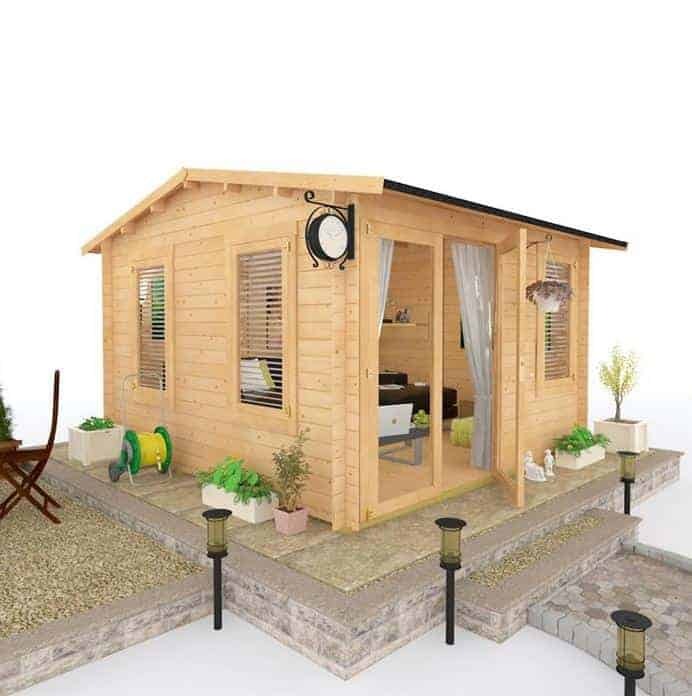 There is no floor as standard, although one can be added for as little as £85, and no extended warranty either and these are the only things which keep this original and good looking log cabin at the foot of our league table.